It must be strange being Elon Musk, lurching haphazardly from delusions of being Tony Stark to delusions of being a 16-year-old CEO. The humble PayPal founder deftly combines valuable contributions to science with Ambien-induced slurs against a man rudely trying to save some children without using the toy submarine that Musk delivered, unprompted, in order to ‘help’. I often get the impression that poor Elon needs the world, the internet, in particular, to love him. His latest random act of pointlessness comes to us in the form of a two-minute track entitled “RIP Harambe”. Harambe was a Cincinnati Zoo gorilla at who was shot after dragging a child into his enclosure. Harambe’s death led to one of the most popular and enduring memes of recent years. 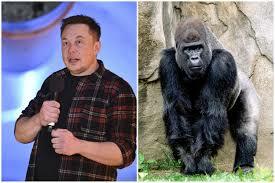 But while the rest of the world has moved on to other things, the shocked Pikachu meme is still going strong, Elon has resurrected the Harambe meme for the purposes of...comedy? Music? Celebration? We really can’t tell anymore. It’s likely steeped in irony and postmodernism, but this has been cunningly disguised by the fact that the song is genuinely awful. You remember during the ’90s how people would make Powerpoint presentations where every single element appeared with a different animation and sound effect. Not because it improved the presentation, but because we were all like children who had been given something to play with for the first time ever. Imagine one of those presentations in song form and you basically have RIP Harambe. We all know how hilariously bad autotune can be, but what’s the worst autotuning you’ve ever heard? Really dig deep, think of Cher’s Believe levels of awfulness, the kind of autotuning that sounds so bad you feel offended that a producer somewhere thought it was acceptable to unleash on the public. It doesn’t matter what example you’re thinking of, RIP Harambe is worse. For the last few years, there have been sporadic press reports about Elon’s habit of staying up late in his room taking drugs and scrolling obsessively through Twitter. If nothing else, RIP Harambe lends credence to some of these reports. Musk is a unique form of celebrity, even amongst entrepreneurs and inventors, and there are few equivalents in history. However, he is far from the first celebrity to take an ill-advised dive into the world of music. Despite how it often appears from the outside, making music isn’t easy. It sometimes seems unfair to poke fun at celebrities who have given their all to something so notoriously difficult as making music and come up short, but then they do something like RIP Harambe, you find yourself suddenly devoid of empathy. However, making music is definitely much more accessible than it used to be. People like Musk are able to make music because many of the traditional technological, knowledge, and skill barriers are no longer there. Many top DJs, such as Pink Fader, are offering beats and samples for sale. This means that you can gain access to professional-quality sounds to use in your own music. Let’s have a look at some of the other celebrities who have tried, and failed, to make it in the music business. Elon Musk isn’t the first celebrity to take an ill-advised trip into the music business, although he is a serious contender for worst offender. Ever since a coked-up Hollywood producer gave the greenlight to Norbit, it’s been hard to take Eddie Murphy seriously. An entire generation of children fell in love with Eddie Murphy as the voice of Donkey in the Shrek franchise. But those children turned on Murphy as soon as they were old enough to watch literally anything else he’d done in the last decade. So, it’s easy to forget that the ’80s were a wild time for Murphy. When he was on top of his game, Eddie Murphy was one of the sharpest comics and social commentators of his generation. 80’s Eddie Murphy wasn’t at all out of place alongside Richard Pryor, Lenny Henry, and George Carlin. His shows drew in huge crowds and appealed to white audiences as well as African Americans at a time when comedy was markedly more segregated than it is today. Eddie’s stand-up shows from this era, notably Raw and Delerious, are still regarded as classic and are regularly cited as an influence by professional comics today. Murphy was also landing an increasing number of headline roles in Hollywood movies. With all of this going for him, you can’t really blame him for feeling invincible. Murphy actually managed to produce a couple of genuine hits during his brief singing career. He even persuaded Rick James to produce one of his tracks. Unfortunately, the resulting collaboration, ‘Party all the Time’, is often cited as being one of the worst songs ever produced. Bruce Willis is best known for his portrayal of maverick cop John McClane in the Die Hard films, a franchise that, ironically enough, just will not die. Most people in 2019 are now in agreement that Die Hard is the best movie of all time and the only acceptable answer to ‘best Christmas movie ever?’. But, as anyone familiar with the rest of Bruce’s filmography can attest to, not everything he touches turns to gold. For a painfully clear example of this, look no further than the enigmatic The Return of Bruno, Willis’s debut musical effort. The unusual combination of pop music and blues was ahead of its time. Unfortunately, people in the future don’t like it either. Although Bruce did manage to somehow score studio time with The Pointer Sisters for ‘Respect Yourself’, a song which wasn’t a total disaster and even qualifies as a hit, albeit one that’s better to forget. His 1989 follow-up ‘If it Don’t Kill You, It Just Makes You Stronger’ could not have been more perfectly misnamed, as it killed any lingering enthusiasm for Bruce Willis the musician. Star Trek legend Leonard Nimoy was one of those actors who exuded a sense of cool. During the late ’60s, Nimoy and co were among the most internationally famous and recognizable stars in the world. Star Trek mania was beginning to take hold and was for the first time encouraging an entire generation of children to think of space as an unexplored frontier. Along with Star Trek, the 1960s were also a good time for LSD. Now, we aren’t saying that all the music made in the 1960s was the result of acid-induced psychedelia. However, we defy you to come up with another explanation for ‘The Ballad of Bilbo Baggins’ and associated music video. Nimoy managed to squeeze out two albums before deciding to pack it in. Unlike many others on this list, Nimoy’s music wasn’t exactly bad, it was just aggressively forgettable. William Shatner is...an interesting character. Most celebrity music careers mirror the personalities and lives of the celebrities involved. William Shatner’s musical productions are quintessentially Shatner. ‘Music’ might be a little bit generous though, these are really mostly spoken word pieces. Seeing the staggering success Leonard Nimoy was having, and not one to be upstaged by a Vulcan, Shatner strolled into a recording studio, sat down and started talking. The Transformed Man featured covers of a number of hit songs of the day, including Lucy in the Sky with Diamonds and Mr Tambourine Man, as well as some original creations. Since the late ’60s, Shatner has produced a handful of other albums, the most recent being 2013’s Ponder the Mystery. Seagal was one of the biggest names in movies during his heyday. Since the apex of his acting career in the late ’80s and early ’90s, Seagal has tried to branch out into a number of other pursuits. He has held a diverse range of careers, including an aromatherapy specialist, a law enforcement officer, purveyor of energy drinks and, of course, music. Seagal managed to work several of his own original compositions into some of his films before he decided to go all in and released his first album. Songs from the Crystal Cave wasn’t well received, adding another body to the pile of failed careers Seagal keeps in his massive Hollywood mansion. Just to prove that there is, in fact, hope for musical celebrities, we present Milla Jovovich. Whether the Resident Evil star is singing alongside Tool frontman Maynard Keenan in his side project Puscifer or belting it out on her own album, Jovovich is a very accomplished musician as well as an actor. If you haven’t heard her stuff yet, we recommend you get on it right now! If nothing else, Elon Musk is at least not alone in having infected the Earth with unnecessarily bad music. It seems that the tradition of celebrities producing ear-splitting music as an ‘easy’ way of boosting their public profile is alive and well. But whereas the other celebrities on this list can at least point to some genuine musical abilities, Musk’s RIP Harambe has all the hallmarks of a producer who has just discovered how Ableton works. What are we saying? Musk is clearly a Fruity Loops kinda guy.